Published Sept. 17, 2018 at 1:02 p.m.
Hard to believe it's been 15 years, but that's the case. Milwaukee's premier DJ team – The Get Down DJs – is celebrating a decade and a half of booty-shaking beats this autumn. And, you'll be entirely unsurprised to hear that these guys plan to celebrate in style. The Soul and Funk Dance Party 15th Anniversary Weekend includes four – count 'em! 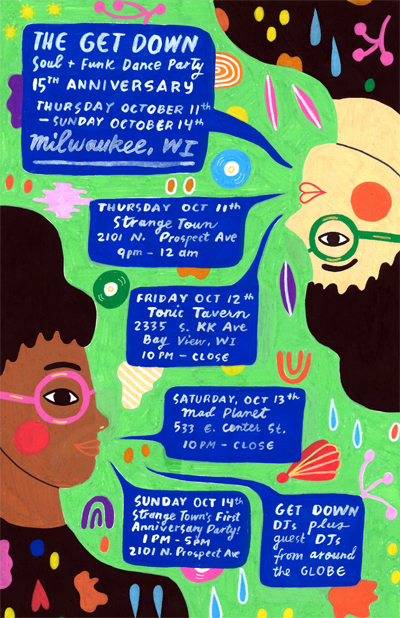 – events, including Thursday, Oct. 11 at Strange Town, 2101 N. Prospect Ave., from 9 p.m. until midnight; Friday, Oct. 12 at Tonic Tavern, 2335 S. Kinnickinnic Ave., from 10 p.m. until closing time; Saturday, Oct. 13 at The Mad Planet, 533 E. Center St., from 10 until last call; and back at Strange Town on Sunday, Oct. 14 for a combination Strange Town first anniversary bash from 1 until 5 p.m. The events feature The Get Down DJs – Andy Noble, Spero Lomenzo and Nesh Malinovic – along with guest DJs Johan Tollgerdt (Modern Love, of Sweden), Tom Noble (Superior Elevation, from NYC) and Ben Mena + Elizabeth Christian (Hipshaker/Hot Pants, from Minneapolis). The Get Down DJs – then brothers Tom and Andy Noble, plus Brent Goodsell and Elliot Oliver – got together in October 2003 to spin rare soul, R&B and funk gems at Quarters Rock & Roll Palace in Riverwest. "In 2003 I think we were actually planning for a long-term, successful run of club events," says Andy Noble. "The basic sound of the Get Down, gritty soul and funk music, was by our thinking one of the only types of music that almost all club going Milwaukeans could agree on. "Add in that there was virtually no representation of it, especially in a party/dance setting, at that time, and I think it was a solid bet that it was going to work." And work it did. Since then the music, the venues and the team have evolved, but always for the better. "We've added in a bit of Latin, disco and boogie over the years, but only records that conform to the initial funky aesthetic of dance-friendly and nothing too slickly-produced," Noble says. "The thing is with classic music is that it stays the same and we all grow, change – evolve – around it. What 20-somethings like about what we played in 2003 has changed a lot. At the beginning it was almost all hard, raw funk. "The younger kids now love the more disco-oriented and early '60s girl group and sweet soul records. We love all of it, we're just happy that any 22-year-olds like any of it, really. It keeps us being able to sustain club nights when all of our peers have stopped going out!" Each year, the DJs have created anniversary mixes and all of those – including this year's – are available on the new GetDownMKE Mixcloud account throughout September and October. With access to these, the party never has to stop.